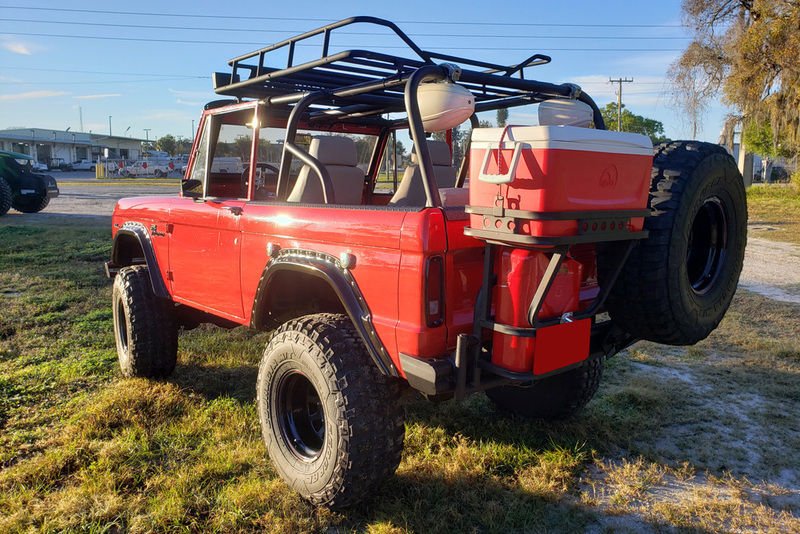 This Ferrari Red Bronco has updated seating for four and a Pioneer radio with Memphis Marine high-output speakers. It’s powered by a 351ci V8 engine mated to 5-speed manual transmission, with approximately 2,500 miles since completion. This Bronco comes equipped with Drake Performance headers, Billet Pulley system, high-performance polished aluminum radiator, aluminum intake, 3" stainless exhaust, Dana 44, power steering and brakes, and Superlift suspension with color matched springs and Pro Comp shocks. The exterior features Bushwhacker fender flares, cowl hood, full roll bar, matte black powder-coated custom roof rack and bumpers.